Start the day with a visit to the Kuromon Ichiba Market (Nipponbashi, Chuo-ku; kuromon.com). Offering everything from fresh meat and seafood to fruits, vegetables and other ingredients, the market is a mere 10-minute walk from Dotonbori Street. Aside from selling these items, Kuromon Market caters to adventurous foodies who don’t mind eating al fresco in a wet market. We sampled Kobe beef here: we bought a small slab sold at around ¥3,000 per 100g, and asked the store to grill it for us. Once you’ve had your fill, you can explore Nipponbashi, also known as “Den Den Town”. You’ll find plenty of electronic stores here, as well as shops selling toys, video games and comics. Otaku Road — where you can find all things manga and anime — is nearby, too. You’ll surely work up an appetite after all that walking and shopping. So for lunch, try Osaka’s famous okonomiyaki and takoyaki. Okonomiyaki is a cross between a pancake and an omelet, and is widely available all around Japan. The Osaka-style okonomiyaki is said to be the most popular, and here the ingredients are mixed much like a pancake, as opposed to the Hiroshima-style okonomiyaki where the ingredients are layered on top of one another. 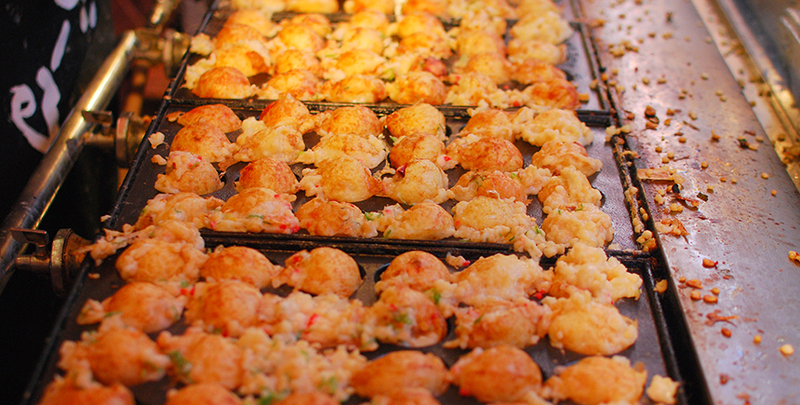 On the other hand, takoyaki are sumptuous balls made of rich batter and octopus. Head to Creo-ru Restaurant (1-6-4 Dotonbori, Chuo-ku), a one-stop shop for okonomiyaki and takoyaki. The restaurant prepares and sells takoyaki on the street, and there are usually long queues waiting for the takoyaki to cook. Six pieces of takoyaki cost around ¥550, while their okonomiyaki costs around ¥1,200. The resto’s yakisoba, or Japanese stir-fried noodles, is exceptional too. After a hearty lunch, explore the Shinsaibashi area. Stroll the 600m-long Shinsaibashi Shopping Arcade, and check out the trendy boutiques and quirky shops there. The shops are interspersed with quaint cafés and food stalls, so you can always stop by for a snack. Try Pablo (Shinsaibashi zero one Bld.1F, 2-8-1, Shinsaibashi-suji, Chuo-ku; www.pablo3.com) for its cheese tarts: the store is very easy to spot because of the long queues in front. When the sun has set and the neon lights have been switched on, check out the famous Glico “Running Man” sign along the Dotonbori canal. At 6pm, head back to Dotonbori Street for your sushi fix. Daiki Suisan Kaiten Sushi (1-7-24 Dotonbori, Chuo-ku; daiki-suisan.co.jp) is one of the typical conveyor belt sushi places in Osaka. Aside from the sushi, the fried octopus here is a must-try.